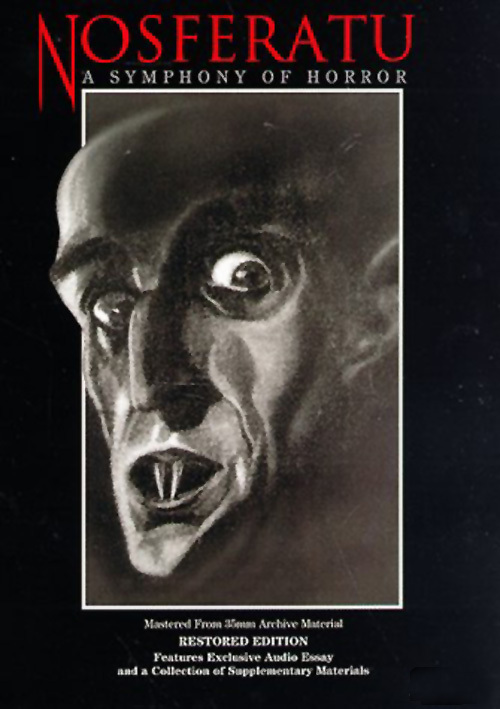 The story behind FW Murnau's adaptation of Dracula is one of those stories that proves fascinating enough to get its own highly fictionalised movie (check back tomorrow for that review). After the production failed to secure the rights to Bram Stoker's novel, Murnau decided to continue anyway, changing the names of the characters and transporting the action to 1830s Germany whilst maintaining several similar plot points. There are some significant differences too as Van Helsing is left out alongside important figures like Lucy Westenra, Quincey and Holmwood and changing the ending quite dramatically. Anyone who knows me or follows me on Twitter will know that I am a massive fan of Dracula. It's a novel that wears its shlocky sensibilities on its sleeve, relishes in telling a continent-spanning tale of horror and is deliriously entertaining as a result. To my mind, no film has managed to quite capture Stoker's novel completely and often, different adaptations capture different aspects of the writing. For example, Bram Stoker's Dracula should be called Francis Ford Coppola's Dracula Which Is Sort of Bram Stoker's Dracula But Not Really as it adds in a whole romantic subplot in which Winona Ryder's Mina is also the reincarnation of Dracula's dead wife for no real reason other than to give Dracula motive. This represents a fundamental misunderstanding of Dracula's character (one which has been replicated in many adaptations); the novel's Dracula has no other motive than to conquer. That's it. No romantically swooning desire to find an eternal mate to ease his loneliness, just an appetite to kill and conquer (don't even get me started on Dracula Untold; name-trading at its finest). This is what makes him such a powerful character because there's no real understanding him unless you too have desire to take over whole countries one neck bite at a time, in which case you probably need to seek help. Returning to Nosferatu, this is one aspect of the film that absolutely gets it right. Count Orlok doesn't really exhibit any other desires beyond getting to Wisberg (a fictional German town subbing for London) and feeding. Of course he goes for Ellen, our heroine, because we need someone to be invested in and audiences will forever have an obsession with damsels in distress and white nightgowns. The film doesn't need to explain Orlok's intentions and that makes him a more haunting figure as a result. We fear what we don't understand and this particular vampire is a classic example of that. The film itself plays on his appearance with the iconic use of shadows to signify his approach. Max Schreck's appearance is one of the most famous in cinematic history and there's a quiet thrill in getting to see his claws in the proper context. It's a great, menacing performance that captures an inhuman quality within Orlok's stare and movements; he's recognisably humanoid, but twisted into a monstrosity that sets him apart as something to be feared, particularly when contrasted with the hero of the piece, Hutter. There clever touches throughout the film that nod towards its central character's habits like transforming the name of the ship that carries Dracula from the Demeter, who was the goddess of the harvest, to Empusa, a demi-goddess who was said to feast on the blood and flesh of young men whilst they slept (and in later mythology became a kind of monster). There are a few little nods like that here and there that offer a wry sense of dramatic irony like Hutter observing the two bites on his neck as the handiwork of mosquitos or Ellen's mysterious disease being described as 'blood congestion'. There are other links back to the novel too, particularly in the combination of the professor teaching his students about carnivorous plants and Knock (a sort of Renfield substitute) snatching flies out of the air and eating them before crying 'the blood is life'. In the novel all sorts of parallels are drawn between Dracula and the predatory natural world around him, especially in his ability to transform himself. Orlok can do so here too, transforming into rats to escape detection aboard the ship. The natural world is highly deadly, a world in which a human can kill flowers by picking them and a wolf can scare off an entire herd of horses. The association is clear; Orlok is a predator himself. Possibly as a result of the alterations that were undertaken, Nosferatu doesn't feel like a great adaptation of Bram Stoker's novel. What it does offer is an excellent interpretation, one that carries over the various important themes and narrative threads and does something inventive with them. The scene aboard the Empusa is every bit as unsettling as the Demeter passage in the novel whilst the ending offers a unique way of the heroine helping to defeat the vampire, just as she does in Stoker's narrative. I doubt there will ever be a superlative adaptation of Dracula because there have been so many different versions and interpretations now that the novel tends to get lost in the middle of it and it's a dense story. However, Nosferatu stands head, shoulders and dastardly eyebrows above every other one I've seen so far.